My parents were both born and raised in India. As an adult, my father was in the British Police Force. My mother worked on a very busy switchboard exchange. After India’s independence from Britain in 1947, there were an increasing number of British citizens born in India and Anglo-Indians who immigrated to Australia. Both before and after its independence, India had faced a lot of race riots. Britain had been in India for 300 years and when the finally left it divided the subcontinent into two independent nation states — the Hindu-majority India and the Muslim-majority Pakistan. Partition, which is what the division of British India was called, triggered riots, there were a lot of deaths, and a great many people migrated to what they hoped would be ‘safe territory’. In the 1950s, when the riots were happening, my parents were advised to leave India. My father took us to Australia. His parents, my grandparents, had arrived in this country some years earlier. They had left behind large houses and servants (who had by that time turned on the ‘whites’, making the country quite unsafe). I remember there being a sort of ‘colour code’ for entry. By that I mean that if your skin was ‘darker than a brown paper bag’ you were rejected from entering Australia. I’d suggest it had something to do with the White Australia Policy of the time. We all passed this test. The other test was that there was no illness. Unfortunately all of us children had whooping cough. 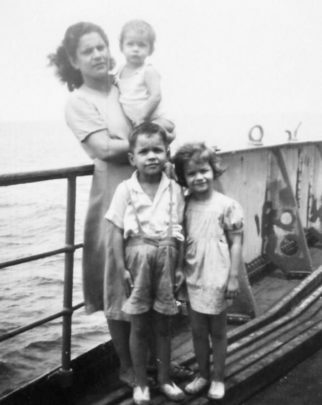 My mother prayed we would not cough as we boarded the ship, which none of us did. We did not come to Australia for free. Our tickets were paid for. I remember there were no free passages for us. We arrived in Sydney, New South Wales. For a time we called Bondi home, but we moved from there to Dee Why about an hour north. We rented our house there. Nothing was given to my parents or our family when we arrived. I recall my father working multiple jobs — I count at least three — to feed and pay the rent and help clothe the six of us (my mother had two more children after we’d arrived). My parents told us not to tell people where we had come from, that some people didn’t like new customs or cultures as it signified their way of living was changing. One day my father and I were talking and he said that in years to come this thinking would change. In the mid-’50s a lot of rich business companies from other cultures and countries were buying real estate and land in Australia and turning it into housing complexes, shopping centres and parks. They were mostly from Asian countries then. However, my father said that while some of the cultural changes and religions in Australia would be positive inclusions there would be those with the opposite effect. I laughed at him at the time, asking if he could see into the future, but I’m beginning to wonder if he was onto something even back then. Have you had to leave your country to live in another? What was that experience like for you?